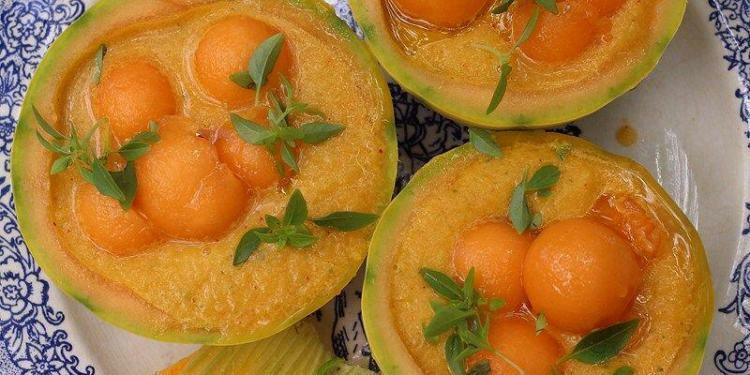 Giuseppina Mabilia, who blends a fusion of tastes from Italy and Provence at her cooking school Venise en Provence shares this recipe for a savoury, cold melon soup. Perfect for a starter in the heat of summer, or for lunch. This is one of my preferred recipes: it's very simple and easy to make but incredibly good and all your guests will enjoy it so much. Now...as the main ingredient is melon you should choose a really good one as that will make the difference. You might be tempted to add something, well...I did in the beginning, then I just reduced the ingredients at the minimum and that's simply perfect. Start with washing the melon then cut them in 2 ( try to make a nice cut if you serve them: equal and clean) and make some balls with a Parisian scoop melon baller, you can easily find it on Amazon if you don't have one. Calculate 5 balls for each serving, set in a bowl and cool in the fridge. Now you can scoop the rest of melon roughly and put in a blender though not all at the same time: start with a small quantity and then add the rest. Mix well. Add the oil, a pinch of salt, the red peppercorn and some of the basil and mix again till you have a smooth consistency. 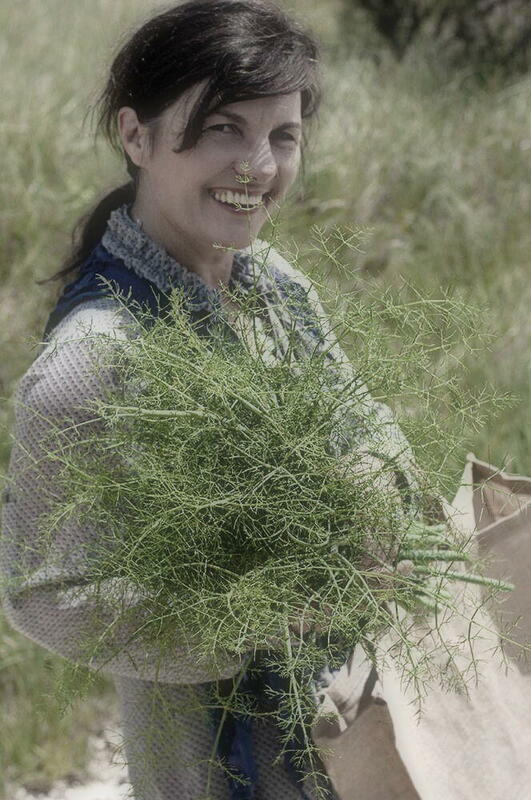 Taste: if it seems to you that it's a bit insipid add a pinch of salt and some extra oil and mix again. Store in the fridge and let it cool 1 hour, then pour in the half melons or in a nice glass or bowl, add the melon balls and some basil. If you have the chance to find small melons you can present this starter as you see in the photo, otherwise I serve it in nice cups or glasses. This recipe is highly influenced by the quality of melons that you use. Interesting! I’ll have to try this once the weather gets a bit warmer. Hi Ashley – yes when the Cavaillon melons are at the height of perfection this soup will be a perfect summer treat. 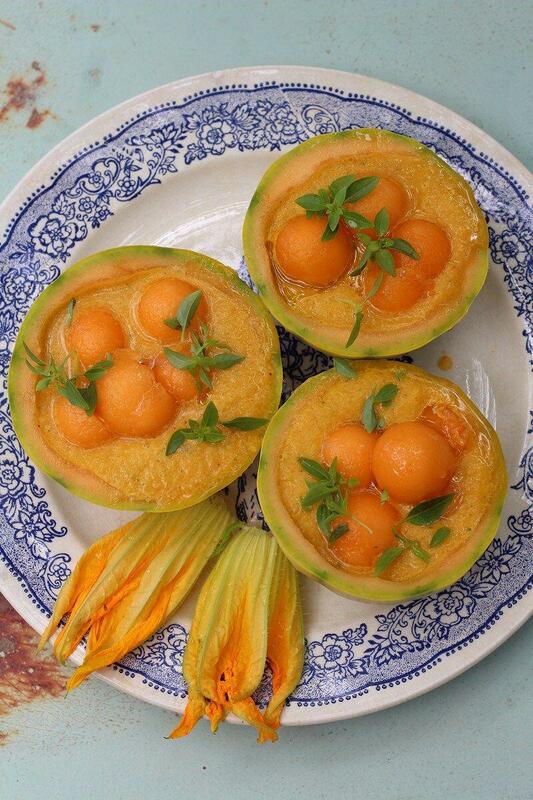 This looks so delightful, and I wish I could get my hands on some Cavaillon melons to make it! (When you said 4-5 small melons, I knew you meant Cavaillons!) 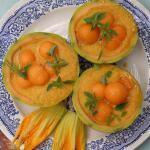 Other nice melons will be coming into season here, soon, and I look forward to making this.